Would you like to set your location to Dayton? 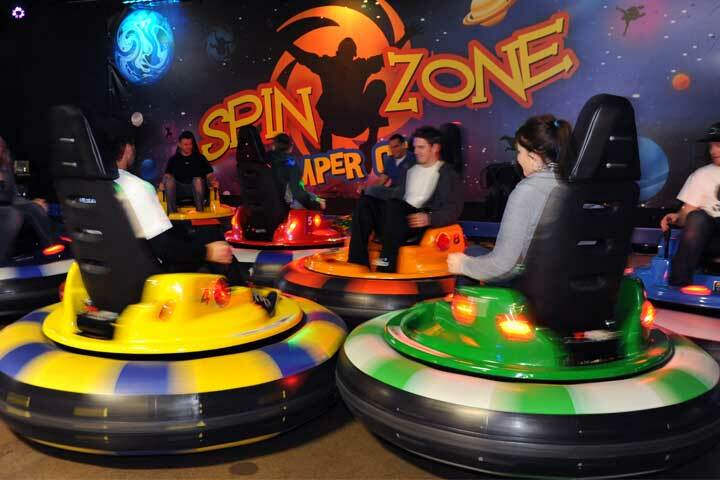 Our SPIN ZONE bumper cars feature an inner tube design, making them safe and incredibly fun. Grab a hold of the handles to move forward or backward, but watch out… your opponents will be aiming for two “Spin Zone” targets on your car. If they bump either one of your targets and activate the “Spin Zone,” they will send your car into an uncontrollable 3-second spin! But have no fear… by bumping your opponents’ targets, you, too, can send them into a tizzy! SPIN ZONE bumper cars have up to 8 cars running at one time. Do you have what it takes to send your opponents and friends into a spin? Must be at least 5 years old AND 48” to ride. the largest amusement trade show in the world! The manufacturers took the timeless concept of bumper cars and made them even more fun by adding different modes such as Chaos mode and Spin mode. Get your Birthday Party Guests spinning by booking a Spin Zone Bumper Car birthday party today! Click the link below to get started! Inflatables meet ninja warriors, can you stay standing after a minute twenty? Take a ride in our brand NEW, 35 foot tall, Drop Tower! Bump, set, spike! Sign up for a volleyball league or rent a court with some friends.